Burlesque Fitness / Dance Class: It's DONE!!! Woooohoooo!!! View pics & video! The Show - Thursday, August 20th! What is Burlesque? Contrary to popular opinion, performing burlesque is not just about stripping (though striptease is often a component). Burlesque is a humorous theatrical entertainment involving parody and sometimes grotesque exaggeration. In 20th century America, the form became associated with a variety show in which striptease is the chief attraction. Burlesque dancing is hard work, and not nearly as easy as professional dancers make it look. Strong core and lengthened muscle tone are required to perform many of the moves. The workshop required a LOT of practice, both in and out of class. 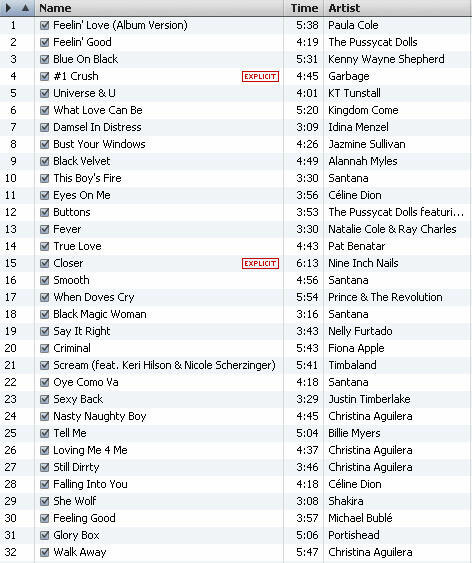 To help me "get in the mood", I created a playlist for my ipod. Having music like this really helped me loosen up. I still use the playlist for my at-home yoga sessions.